Availability: Mon Oct 8, Wed Oct 10, Wed Oct 17, OR Wed Nov 7, Wed Nov 14, Wed Nov 28, OR Wed Dec 5, Wed Dec 12, Wed Dec 19, ONLY! Materials Arts Provider Provides: Leslie will provide all handouts, accessible research cards and images, and will bring all props, materials, and sound effects to be used in the sessions. Space and/or Set Up Requirements for Program: Regular classroom set up. Please provide some clear table space (for Leslie's supplies) and some open white board or chart paper space where Leslie can model writing. Program Learning Objective: I CAN understand and explain with evidence ways an animal adapts to and survives in its environment. I CAN organize research details into categories. I CAN write expressively with sensory details and figurative language. I CAN speak with purpose and actively listen to peers in the classroom. Program Description (Grade Level Program): Poetry and theater both have a unique power to inspire and engage, and when applied to science topics, these art forms can become powerful tools to motivate students to read non-fiction texts, conduct research, and express their knowledge in creative ways. 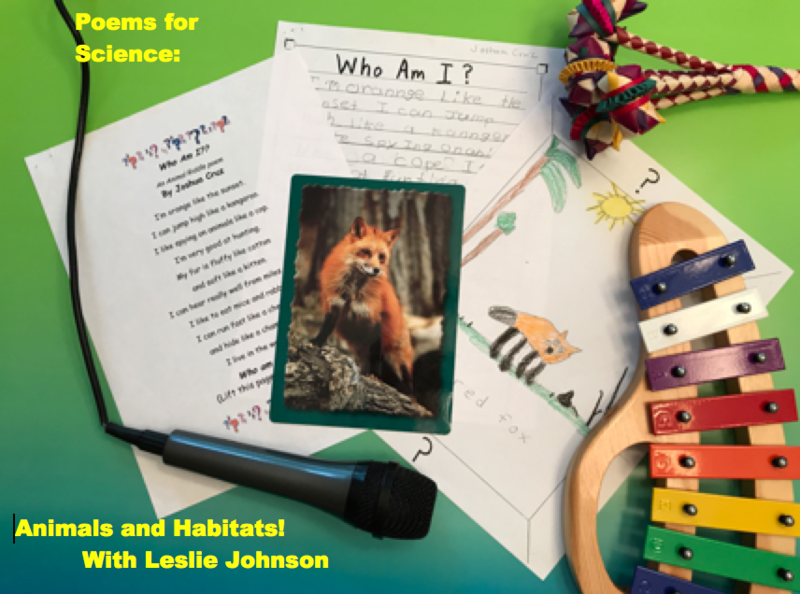 “Poems for Science: Animals and Habitats” uses drama and arts-infused creative writing activities to involve students in learning about how animals adapt to and survive in particular habitats and ecosystems. 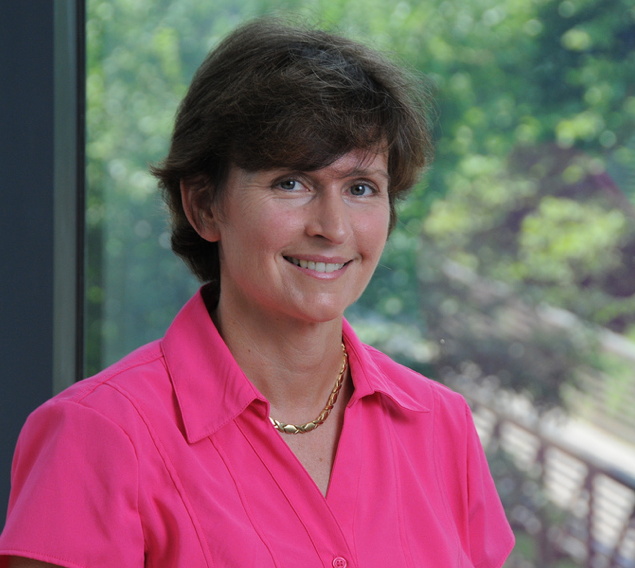 For this program, Leslie will provide colorful, accessible research sources about animals and their habitats for students to use, along with graphic organizers designed by Leslie for students to organize their research. Classroom activities may include: *“Habitat Theater”: With simple props and sound effects, students take on the roles of different parts of a habitat, reinforcing knowledge and illustrating how different parts of a habitat work together to create an ecosystem. *Visual art creations of habitats and wildlife. *Expressive poetry (such as persona poetry or odes) that combines facts from research with poetic techniques. *Dramatic performance of animal poetry and active listening activities. As students perform their poetry, they are the “experts” teaching the class, and their classroom audience is rewarded (in a fun “active listening” game facilitated by Leslie) for listening to and learning from each other. This program is designed to enhance understanding of science concepts while also building grade-level skills of reading, writing, speaking and listening. Parent Engagement Opportunities: Caregivers are welcome to participate in the classroom workshops at the discretion of the classroom teachers. Grade 1: Writing Standards: Text Types and Purposes #2: Write informative/explanatory texts in which they name a topic, supply some facts about the topic, and provide some sense of closure. Grade 1: Next Generation Science Standards: From Molecules to Organisms: Structures and Processes #1-LS1-2:	Read texts and use media to determine patterns in behavior of parents and offspring that help offspring survive. Grade 1: Theater: Creating: Anchor Standard #TH:Cr3.1: Refine new work through play, drama processes and theatre experiences using critical analysis and experimentation. b. Identify similarities and differences in sounds and movements in a guided drama experience (e.g., process drama, story drama, creative drama). Grade 2: Writing Standards: Text Types and Purposes #2: Write informative/explanatory texts in which they introduce a topic, use facts and definitions to develop points, and provide a concluding statement or section. Grade 2: Next Generation Science Standards: Biological Evolution: Unity and Diversity #2-LS4-1:	Make observations of plants and animals to compare the diversity of life in different habitats. Grade 2: Theater: Creating: Anchor Standard #TH:Cr1.1: Generate and conceptualize artistic ideas and work. c. Identify ways in which voice and sounds may be used to create or retell a story in guided drama experiences (e.g., process drama, story drama, creative drama). Grade 3: Writing Standards: Text Types and Purposes #2: Write informative/explanatory texts to examine a topic and convey ideas and information clearly. a. Introduce a topic and group related information together; include illustrations when useful to aiding comprehension. b. Develop the topic with facts, definitions, and details. Grade 3: Next Generation Science Standards: Independent Relationships in Ecosystems #3-LS4-3: Construct an argument with evidence that in a particular habitat some organisms can survive well, some survive less well, and some cannot survive at all. Grade 3: Theater: Creating: Anchor Standard #TH:Cr2.1: Organize and develop artistic ideas and work. TH:Cr2.1.3 a. Participate in methods of investigation to devise original ideas for a drama/theatre work. b. Compare ideas with peers and make selections that will enhance and deepen group drama/theatre work. Grade 4: Writing Standards: Text Types and Purposes #2: Write informative/explanatory texts to examine a topic and convey ideas an information clearly. b. Develop the topic with facts, definitions, concrete details, quotations, or other information and examples related to the topic. Grade 4: Next Generation Science Standards: From Molecules to Organisms: Structures and Processes #4-LS1-1:	Construct an argument that plants and animals have internal and external structures that function to support survival, growth, behavior, and reproduction. Grade 4: Theater: Performing: Anchor Standard #TH:Pr6.1: Convey meaning through the presentation of artistic work. a. Share small-group drama/theatre work, with peers as audience. Grade 5: Writing Standards: Text Types and Purposes #2: Write informative/explanatory texts to examine a topic and convey ideas an information clearly. b. Develop the topic with facts, definitions, concrete details, quotations, or other information and examples related to the topic. Grade 5: Next Generation Science Standards: Ecosystems: Interactions, Energy, and Dynamics #5-LS2-1:Develop a model to describe the movement of matter among plants, animals, decomposers, and the environment. Grade 5: Theater: Performing: Anchor Standard #TH:Pr6.1: Convey meaning through the presentation of artistic work. TH:Pr6.1.5 a. Present drama/theatre work informally to an audience. Grade 6: Writing Standards: Text Types and Purposes #2: Write informative/explanatory texts to examine a topic and convey ideas, concepts, and information through the selection, organization, and analysis of relevant content. b. Develop the topic with relevant facts, definitions, concrete details, quotations, or other information and examples. Grade 6: Next Generation Science Standards: Ecosystems: Interactions, Energy, and Dynamics: #MS-LS2-1: Analyze and interpret data to provide evidence for the effects of resource availability on organisms and populations of organisms in an ecosystem. Grade 6: Theatre: Creating #TH:Cr2.1 Anchor Standard: Organize and develop artistic ideas and work. b. Contribute ideas and accept and incorporate the ideas of others in preparing or devising drama/theatre work.